Make fun sports jewelry both boys and girls will love. 12-15mm plastic beads with 2.5-3.5mm holes. They easily slide onto thick cord or even shoelaces. 4 styles: baseball, football, soccer and basketball beads. Make fun sports jewelry both boys and girls will love. 12-15mm plastic beads with 2.5-3.5mm holes so they easily slide onto thick cord or even shoelaces. Pack of 144. 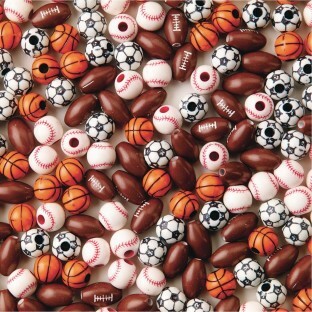 Four different styles include baseball, football, soccer and basketball beads. Good value for craft weekly use. I would buy these again. Nice big holes make these easy to string. The boys especially liked these.